Olivia de Havilland is the last surviving principal cast member from Gone With the Wind. She played Melanie, the sweet southern belle with a backbone of steel, and de Havilland is reportedly very much like the character she portrayed. She won two Oscars, for To Each His Own, a 1946 drama in which her character became pregnant out of wedlock, and three years later as The Heiress, in which Montgomery Clift might be pursuing her only for her money. She was also nominated for Hold Back the Dawn, in which Romanian Charles Boyer might be pursuing her to marry his way to US citizenship; for The Snake Pit, where her character was committed to an insane asylum; and for Gone With the Wind. De Havilland got two big breaks in one summer production of A Midsummer Night's Dream. First, she understudied for Gloria Stuart's character, Hermia, and in true Hollywood fashion got the role when Stuart had to drop out. Then Warner Bros decided to film the stage production as a feature, and De Havilland signed a seven year contract with the studio. Warner Bros typecast de Havilland as a sweet, innocent damsel in distress, and that became her enduring screen persona. She proved perfect rescue fodder for Errol Flynn, and they made eight films together, including the classics The Adventures of Robin Hood (she was Flynn's Maid Marian), Captain Blood, The Charge of the Light Brigade, The Private Lives of Elizabeth and Essex, and They Died with Their Boots On. De Havilland was reportedly infatuated with Flynn, and while she never confirmed an affair, she has said, "He was the one I enjoyed kissing most. When I was working with him, I could hardly wait to get to rehearsal." Gone With the Wind was, of course, a wildly popular novel before it became the biggest movie of its time. While the film's producers scoured the nation looking for an actress to play Scarlett O'Hara, de Havilland was one of the few 'name' actresses at the time not pleading for the role. Instead she wanted to play Melanie, a supporting role, and she convinced Warner Bros to "loan her out" to a rival studio for the production. There were problems on the set, and the film went through several directors. One of them, George Cukor, was a gay man known as a "woman's director" and Clark Gable felt that his character was getting short shrift, so Cukor was fired. Victor Fleming received the sole screen credit as director despite directing only about half of the film, but he simply loathed actresses, leaving de Havilland so fearful that she would sneak off to have Cukor help with her role. 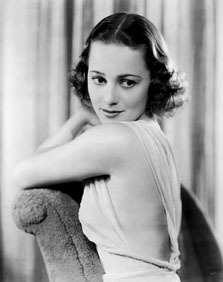 When she returned to Warner Bros after Gone With the Wind, de Havilland was dismayed that, despite her Oscar nomination, Warners wanted her to resume playing ingenue roles. She begged for more substantial parts, but the studio continued to cast her in light romantic comedies. When de Havilland was "loaned out" again for the drama Hold Back the Dawn in 1941, she was again Oscar-nominated, but found herself competing with her sister, Joan Fontaine, who had been nominated for Alfred Hitchcock's Suspicion. The two actresses had been fiercely competitive even as children, and Fontaine, who was one year younger, said that de Havilland never got over having to share their mother with another child. Reportedly Fontaine had not planned to attend the ceremony, until de Havilland persuaded her that she must. The sisters were then seated at the same table, and when Fontaine won the award she ignored de Havilland's attempt to congratulate her. This fanned their sibling difficulties into a life-long feud. Following Hold Back the Dawn, de Havilland returned to Warners again, but she began refusing the lightweight parts that the studio wanted her to play. In return, the studio repeatedly placed her on suspension. When her seven-year contract expired, the studio said that she still owed them time from her suspensions, and de Havilland sued. During the three years of the lawsuit, she was unable to work in film, and instead entertained soldiers in the US, the Aleutians, and in the South Pacific. The lawsuit was decided in de Havilland's favor, breaking what is now called "The de Havilland Clause," and reducing the tight control that studios had over performers. Triumphantly returning to the screen, de Havilland began to choose her own projects, and had a long string of successes. In 1946, when she won the Oscar for To Each His Own, the Academy arranged for her sister to present the award, and photographers famously caught the moment when de Havilland refused Fontaine's congratulatory handshake. Some sources say the Fontaine-de Havilland feud was overplayed for the tabloids, while others say the sisters several times went years without speaking to each other. Their last reported spat came the night before the Academy Awards in 1987, when they were inadvertently booked in adjacent rooms in the same hotel. Fontaine immediately demanded a room on a different floor. During the 1950s de Havilland's career began fading, and she refused more and more roles, saying that she did not approve of their content. She has said that she turned down the role of Blanche Dubois in A Streetcar Named Desire, later played by Vivien Leigh opposite Marlon Brando. In the latter part of de Havilland's film career, her most memorable movies were the camp classics Hush... Hush, Sweet Charlotte with Bette Davis, and Airport '77 with Jack Lemmon. Her last feature film was 1979's The Fifth Musketeer, with Cornel Wilde and Beau Bridges. She continued working in television through the late 1980s. In 1955, she married author Pierre Galante and moved to France, and in 1962, she published a book, Every Frenchman Has One, about her difficulties adjusting to life in France. In 1979 she divorced Galante, but when he was diagnosed with cancer, she returned to his side and cared for him for years after their divorce, until his death in 1998. At last report she remains in good health, living in a Paris townhouse near the Bois de Boulogne.